Charlie Parker was born in Kansas City, Kansas, on August 29, 1920, his father a small-time singer and dancer, and later a Pullman chef. Some seven or eight years later the family moved across the river to Olive Street, near the nightlife center of Kansas City, Missouri. 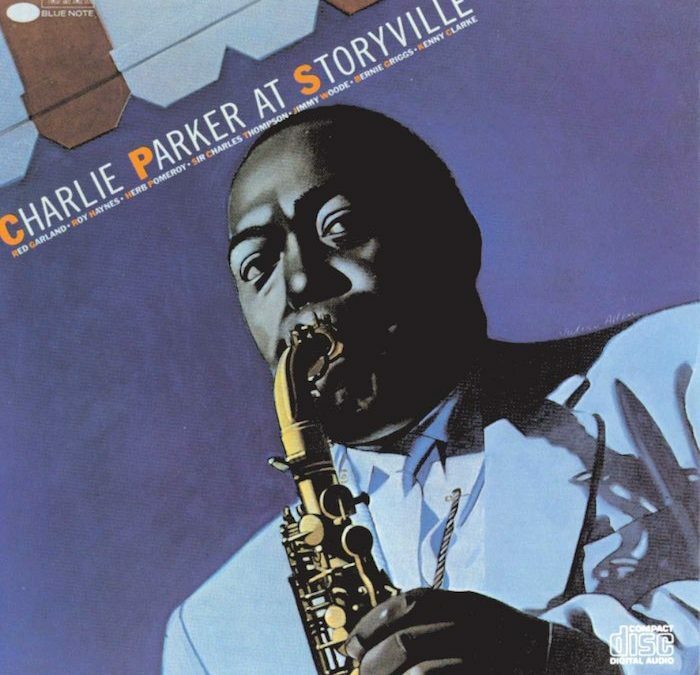 Charlie Parker’s father left home before the boy had finished grammar school and he grew up loved, indulged, and not a little spoiled by his mother, Addie. Bird quit school around 1935 to become a full-time musician or rather, at first, an earnest, vulnerable apprentice. The story of his apprenticeship is worth detailing, for it reveals that even Bird had to look hard and long to find himself musically. Jo Jones, also in Kansas City during this period, adds that there was also a player named Walter Knight. “I have never heard anybody play a sax like he did in my life. I can hear a little of it in Charlie Parker,” Jones recalled. But it’s likely that another man active in Kansas City at that time was the direct influence on Bird, if anyone ever was. Again it’s Jo Jones who recalls the context: “The greatest band I ever heard in my life was Walter Page’s Blue Devils band….In the band was Buster Smith. Buster was an alto player who used to be called Prof, and he was Charlie Parker’s musical father.” Ben Webster and Jimmy Rushing, also on the scene at the time, agreed with Jo. Gene Ramey remembers meeting a downcast Bird on the street. (As an index of the musical liveliness of Kansas City around this time, Count Basie was playing on one side of that street and Duke Ellington on the other, with the local musicians running from one club to the other during intermissions.) Bird told Ramey that while there were an awful lot of jam sessions in town, he, Bird, was one of the few musicians who were never allowed to sit in. The ban relaxed, however, and one night Ramey and Bird sat in at the Reno Club where Count Basie was working. Jo Jones was on drums, and Bird, though starting well, suddenly fell out of the key, couldn’t find it again, and then lost the time. Jo Jones stopped drumming. In the awful silence Jones took one of his cymbals and threw it at Parker’s feet (as he was to do many years later in New York when Cecil Taylor tried to sit in with a group that included the fiercely exacting drummer). There was laughter, and Bird, humiliated, packed up his horn and left the club. In time, however, jobs became scarce in Kansas City; there were tensions at home with Rebecca, his first wife; and Bird, pawning his horn, left town for a period of scruffy wandering. He showed up in Chicago at a session at which Billy Eckstine was in attendance and years afterward described: “The vogue before the war was to have a breakfast dance on one day of the week. Every club in Chicago, at some time or another, would have a breakfast dance, with the show going on at six thirty in the morning. “One spot there, the 65 Club, had a breakfast dance one morning, and they had a little combo with King Kolax on trumpet; a kid named Goon Gardner, who could swing like mad, on alto; John Simmons on bass; and Kansas Fields, drums. “And this cat gets up there, and I’m telling you he blew the bell off that thing! It was Charlie Parker, just come in from Kansas City on a freight train. I guess Bird was no more than about eighteen then, but playing like you never heard—wailing alto then…. The somewheres was New York and Bird himself took up the story at this point in an interview some twelve years later in Down Beat: “For three months he washed dishes in Jimmy’s Chicken Shack in Harlem. This was at the time Art Tatum was spellbinding late-hour Shack habitues. Charlie got $9 a week and meals. Then [when Tatum left] he quit and bummed around a while, sleeping where he could. “’I didn’t have any troubles with cops,’ he recalls. ‘I was lucky. I guess it was because I looked so young.’ There was a series of skimpy jobs, such as a gig at Monroe’s Uptown House where Charlie sometimes got 40 or 50 cents a night. If business was good, he might get up to $6. During this same period Bird experienced an epiphany, or so he said later. At a chili house on Seventh Avenue in Harlem Bird used to jam with a guitarist named Buddy Fleet. He had become bored with the standard chord changes, even the advanced standard chord changes, and, he later told an interviewer, “I kept thinking there’s bound to be something else. I could hear it sometimes, but I couldn’t play it.” Then one night, as he and Fleet were improvising on Cherokee, Bird discovered that by making a melody line of the higher intervals of a chord—and then using appropriate changes for that new chord-derived melody line—he could indeed play what he had been hearing. Bird went back to Kansas City for his father’s funeral, played with Harland Leonard’s band for five weeks (being asked to leave for chronic lateness), and joined Jay McShann’s band, coming out of Kansas City. Gene Ramey has described the McShann band of that period and the restless Parker: “The Jay McShann band was the only one I’ve ever known that seemed to spend all its spare time jamming or rehearsing. We used to jam on trains and buses, and as soon as we got into a town, we’d try to find somebody’s house where we could hold a session. All this was inspired by Bird because the new ideas he was bringing to the band made everybody anxious to play. “We were at a club in New Orleans on one occasion, playing a one-nighter, when we were informed by Decca that we were due for a record session in a couple of weeks. McShann suggested that we get together and do something real quick. It was one of those real warm days in New Orleans, but we got together and had a little session and the ideas came across. I guess in about forty-five minutes we had The Jumpin’ Blues ready. This arrangement was all a ‘head’ put together by Bird, and the record featured one of his first great solos on wax. “Everything had a musical significance for Bird. He got into his music all the sounds right around him—the swish of a car speeding down a highway, the hum of the wind as it goes through the leaves. Everything had a musical message for him. If he heard a dog bark, he would say the dog was speaking….And maybe some girl would walk past on the dance floor while he was playing, and something she might do, or an expression on her face, would give him an idea for something to play on his solo. As soon as he would do that, we were all so close we’d all understand just what he meant. He might be looking another way, but as soon as he played that little phrase, everybody would look up and get the message…. “Now that I look back on it, Bird was so far ahead of his time that nobody really appreciated just how radical his ideas were. For instance, we used to jam Cherokee a lot, and Bird had a way of starting on a B natural against the B flat chord and he would run a cycle against that—and probably it would only be two or three bars before we got to the channel [middle part] that he would come back to the basic changes. After traveling to Texas and then the Carolinas, back to Chicago and Kansas City, the McShann band headed to New York and the Savoy. In New York Bird quickly attracted musicians’ attention, both with the McShann band and at Monroe’s in Harlem, where he doubled at night. In Ross Russell’s biography of Charlie Parker, Bird Lives!, Clarke adds that he and his musical colleagues persuaded Parker to move from Monroe’s to Minton’s. “Pretty soon Minton’s got to be a bad place for older cats. Dizzy began coming up regularly and that gave us the four key instruments—trumpet, alto, piano [Thelonious Monk], and drums. That, plus a good bass, was the band of the future. Parker left the Jay McShann band at the end of 1941, worked intermittently and unsatisfyingly with other bands, and finally joined an Earl Hines orchestra which included Dizzy Gillespie, Benny Harris, and Sarah Vaughan. Hines needed a tenor saxophonist at the time, and so he bought a tenor for Bird. With the band rehearsing days, Parker and other sidemen jammed at Minton’s by night. So Hines had been forewarned. This incident with McShann—and others to be related which took place while Bird was with Hines—indicate, moreover, that the notion in later years that “society,” “the system,” eventually caused the terminal disintegration of Bird has to be measured in the context of what Bird did to himself for much of his life. The other members of the McShann and Hines bands had, after all, also been black and had also been certainly sensitive to the overwhelming racism in the society at large. But it was Bird who chronically goofed off. “Bird,” Billy Eckstine has written in the Melody Maker, “used to miss as many shows as he would make [with Hines]. Half the time we couldn’t find Bird; he’d be sitting up somewhere sleeping. So he often missed the first shows, and Earl used to fine him blind…. We got on him too because we were more or less a clique. We told him, ‘When you don’t show, man, it’s a drag because the band don’t sound right. You know, four reeds up there and everything written for five.’ We kind of shamed him. “Sure enough, we come to work the next morning, we get on the stand—no Bird. As usual. We think, so, he said he was going to make the show and he didn’t make it. “This is the gospel truth. After we played the whole show, the curtains closed, and we’re coming off the band cart, when all of a sudden we hear a noise. We look under the stand, and here comes Bird out from underneath. He had been under there asleep through the entire show! “Another thing happened at the Paradise. You see, Bird often used to take his shoes off while he was up on the stand and put his feet on top of his shoes. “He wore those dark glasses all the time he was playing, and sometimes, while the acts were on, he would nod and go off to sleep. This particular time, the act was over and it was a band specialty now. So Bird was sitting there with his horn still in his mouth, doing the best faking in the world for Earl’s benefit. “Earl used to swear he was awake. Bird was the only man I knew who could sleep with his jaws poked out to look like he was playing, see? So this day he sat up there, sound asleep, and it came time for his solo. Bird was with Hines for ten months, playing tenor. He was making $105 a week, the largest sum he’d ever earned. (He used to average $55 to $60 with McShann). But the salaries started going down as the band hit an Army-camp tour in a package involved with a beer company. There were also booking hassles, and finally Charlie dropped out in Washington in late 1943. Unfortunately, the Hines band that possessed all this explosive talent capped by Dizzy and Bird never got a chance to record. The recording ban had gone into effect August 1, 1942, and lasted all the time Bird was in the band and beyond, into November, 1944. After Bird worked for a time with Sir Charles Thompson, there came other gigs, including stays with Cootie Williams, Andy Kirk, and Carroll Dickerson in Chicago. In 1944 Bird went on the road with a Billy Eckstine band which included Dizzy Gillespie, Sarah Vaughan, Gene Ammons, and Art Blakey. The Eckstine band, however, was too experimental to make it commercially at that time and finally evaporated. Bird, meanwhile, had tired of the big-band scene and returned to New York for the freedom of small combos. His influence grew more and more rapidly as he played frequently along 52nd Street in bands led by Ben Webster, Dizzy Gillespie, and a group Bird himself headed at the Three Deuces with Miles Davis, then eighteen, on trumpet. He also made records through 1944–45, starting with his first small band date under Tiny Grimes on Savoy, followed by sessions with Clyde Hart, Dizzy Gillespie, Sarah Vaughan, Red Norvo, Slim Gaillard, and dates under his own name on Savoy that included Ko-Ko, Billie’s Bounce, Now’s the Time, and Thriving from a Riff (which contained a chorus that later became Anthropology). Bird’s renown among musicians in the East accelerated and his records expanded the impact across the country and eventually into Europe. Tony Scott, then a youngster fresh from Juilliard and an Army stint, describes Bird’s impact on a characteristic newcomer to jazz: “The first time The Street heard Bird, I think, was around 1942. Bird came in one night and sat in with Don Byas. He blew Cherokee and everybody just flipped. In late 1945 Bird went out to the West Coast and a date at Billy Berg’s with a band led by Dizzy Gillespie that included Milt Jackson, Ray Brown, Al Haig, and Stan Levey. Bird now was close to the breaking point both physically and emotionally. Parker had started his heroin habit at the age of fifteen. It remained with him for most of the rest of his life. Like most addicts he became a reasonably expert hustler—“borrowing” money, clothes, and sometimes horns. The breakdown, the first widely visible breakdown, took place during that mid-forties engagement on the West Coast where, as Parker felt, “Nobody understood our kind of music. They hated it.” Yet Dizzy Gillespie, experiencing the same hostility, did not collapse. But Dizzy had not already weakened himself by years of addiction and other ways of self-destruction. At Billy Berg’s Bird missed sets and even whole nights. Lucky Thompson was hired as a kind of permanent substitute and he was often needed. Dizzy left for the East and Bird remained—harried, rushing closer to disintegration. Parker was at Camarillo for almost seven months. When he was released he recorded again for Dial in February, 1947. He sounded recovered, and was playing brilliantly again. Back in New York in 1947, Bird headed a series of small combos, continued to record, toured with Jazz at the Philharmonic in 1948, was in Europe in the summer of 1949, worked the new Birdland club (named in his notorious honor) in 1950, when he also signed a new recording contract, this one with Norman Granz, that offered him more security than any recording agreement he had yet had. By this point Bird was also getting broader recognition from the jazz audience—though not from the general public. Starting in 1950, he won the Down Beat poll every year, as well as almost all other ballotings in both American and foreign jazz publications. For a time Parker recorded and toured with strings, the touring being much less orderly than the recordings. Never the most stable of performers, before or after Camarillo, Bird became increasingly unpredictable, as Ross Russell details in his biography of Parker. Trying to avoid narcotics he became a sometimes heavy drinker, the latter addiction leading to a serious ulcer attack which hospitalized him. Still, there were occasional periods of surface calm and highly expert playing. But more and more frequently Bird acted bizarrely. And when not bizarre he was often desolate. On March 4, 1955, Parker figured in an utterly dismaying scene, the most painful I have ever witnessed in more than thirty years of jazz listening. One night, going down the stairs to Birdland, I saw Bird, tears streaming down his face, coming up. He stopped and said, “I’ve got to see you. It’s very important. Very. I’ll call you tomorrow.” He never did. In March, 1954, Parker’s three-year-old daughter, Pree, died suddenly of pneumonia while he was on the road and that grief never left him. Meanwhile, his behavior grew more strange. In the fall of that year, during an engagement at Birdland with a string group, Parker started lacerating his sidemen on stand and then summarily fired them. Having been drinking all that evening, he topped his straw-boss performance by slumping into a chair on the bandstand and falling asleep. Later that night he attempted suicide. Shocked by how close he had come to actually ending himself, Bird stopped drinking and agreed to report regularly to the out-patient clinic at Bellevue for psychotherapy. The cracked center would not hold, however. His drinking began again, and Bird was now traveling from city to city as a single, working with local rhythm sections. There were times when he still played well, but much of his work was considerably below what listeners expected of him. “He’s just an historical figure now,” one musician said sadly. A disappearing soul calling out to a spirit already irredeemably hidden from everyone, including itself. Finally the stage was empty. Wednesday of the next week, in the apartment of a friend, Baroness Pannonica de Koenigswarter, a woman who was also a genuine friend of Thelonious Monk, Art Blakey, and other jazz musicians, Bird died. Among the causes of death were stomach ulcers, pneumonia, advanced cirrhosis of the liver, and a possible heart attack. The attending physician, basing his judgment on the physical condition of the corpse, estimated Bird’s age as between fifty and sixty. He was thirty-four. The Sunday afternoon before he died, Bird was to have played at the Open Door. The Open Door was a large, perpetually barren-feeling room (even when filled) in a drab, past-caring-to-care section of Greenwich Village. He had played there several times before at Sunday sessions. This Sunday he played not at all. He made an appearance, but all the time he was there he ignored his horn. At one point a friend, another musician, found him in the men’s room. Bird was looking at himself in the washroom mirror. He was slowly, carefully and firmly putting himself down in a conversation with the face in the mirror. The conversation went on for some time, adding the newcomer in an odd trialogue. Finally Bird looked hard at the mirror and harshly called the image the worst enemy he had. But, the other musician observed drily, “you’ll never have a friend closer to you than that.” Bird laughed and went out into the club. But he didn’t play. This same musician tells how Bird would often clam up for several hours, not say a word to anyone. Then, in the same evening, he might suddenly talk for a long stretch—and talk with brilliance. “You know,” this musician said as an afterthought, “in one thing he was consistent. He was wonderful with children.” Chan Parker, with whom he lived last, has a young daughter from a previous marriage, a child of unusual sensitivity. The child needed love, very much love. Bird gave it to her without reservation. “Bird,” says Chan, “was a gentle man although he hid it much of the time.” Chan tells of Bird’s delight in shopping in joke shops for such child-surprising excitements as a can labeled peanut brittle which exploded on opening into a swirling of snakes. When he came home from the road, whether he had much money or barely any, he’d bring presents for the kids. Bird was ambivalent about the road. “There were sections of the country he didn’t want to work,” Chan recalls. “The West Coast because of the bad memories of what happened there. And the South for obvious reasons. He went South with the Stan Kenton tour the year before he died because so much loot was involved. But ordinarily he didn’t want to work west of Chicago or south of Washington. He didn’t like all the places he worked within those boundaries either. ‘Why,’ he said once, ‘am I playing in cellars?’ And he was bruised again each time the police shook him down in a new town. And some of the club owners were far from human to him. As far back as 1949 Bird was talking about how he wanted to study more, though he never did. John Wilson and Mike Levin reported in an illuminating Down Beat interview of that year: “For the future, he’d like to go to the Academy of Music in Paris for a couple of years, then relax for a while and then write. The things he writes all will be concentrated toward one point: warmth. While he’s writing, he also wants to play experimentally with small groups. Ideally, he’d like to spend six months a year in France and six months here. “Relaxation is something Charlie constantly has missed. Lack of relaxation, he thinks, has spoiled most of the records he has made. To hear him tell it, he has never cut a good side. Some of the things he did on the Continental label he considered more relaxed than the rest. But every record he has made could stand improvement, he says. We tried to pin him down, to get him to name a few sides that were at least better than the rest. He also talked of other classical music he liked. I have no way of knowing how intimately he knew these works but I can testify that he spoke with a strength of emotion that could not have been entirely put on. Or maybe, being Bird, it could have. Anyway, this is what he said: “I first began listening seven or eight years ago. First I heard Stravinsky’s Firebird Suite. In the vernacular of the streets, I flipped. I guess Bartok has become my favorite. I dig all the moderns. And also the classical men, Bach, Beethoven, etc. In many ways Bird was a protean master of the put-on, including, of course, his ability to put himself on. But there is no question that, when he wasn’t obsessed elsewhere, Bird found music to be the only element of his life which gave him some realistic promise that all kinds of things could suddenly open up. On the other hand, for all the adulation he eventually received from hordes of younger musicians, he was insecure more often than not because he strongly sensed, I think, that he had only fulfilled part of his potential, maybe only a small part, and he did not know how to make the next leap. Bird did not have, to say the least, the discipline that John Coltrane relentlessly exercised in his last years, a discipline by which Coltrane kept forcing himself to dig deeper and deeper into his resources, his potential, while adding to those resources. He hadn’t failed, of course. Bird turned jazz around, as Louis and Duke had before him, and Coltrane was to afterward. But he could have gone farther and he knew that. The late Dave Lambert, who had known Bird very well, said: “He had experienced everything in his life except peace.” Whose fault was that? And another musician, Teddy Blume, who managed Bird for a time, said that being with Charlie Parker over a long period was like “having a terrible disease.” Whose fault was that? But why did others survive? Dizzy Gillespie, Duke Ellington, Cecil Taylor? I don’t know and I doubt if anybody else really does. But just as there is no quick, easy way to explain Bird’s astonishing creativity, so there is no instant explanation of his greatly premature extinction. More than any critic or biographer, it would more likely be a novelist, a black novelist, who might eventually illuminate those parts of the cold inner darkness that finally took over all of Bird. There have been many tragic figures in jazz, but perhaps none was so rudderless, so beset by hellhounds on his trail, than Bird. And some of those hellhounds had his face. Finally, McLean obeyed Bird’s command. “Don’t you ever allow this to happen to you,” Bird said to him. Bird knew it wasn’t only “they” who had destroyed him. But he never knew how he could keep himself from helping “them” to destroy him. All the other changes he knew, but not that one.